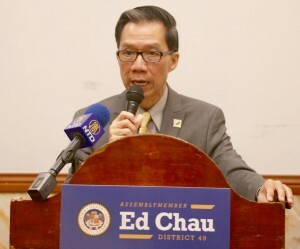 On March 02 assemblymember Ed Chau (D–Monterey Park) unveiled his 2018 legislative bill package, which focuses on the important work he will be doing in the areas of privacy and consumer protection, child protection, and public safety. Assembly Bill (AB) 375 would ensure that consumers enjoy choice and transparency in the treatment of their personal information when accessing the internet by requiring an Internet Service Provider to get opt-in consent from consumers in order to use, disclose or permit access to sensitive customer personal information for reasons other than providing the service. It also prohibits providers from charging a penalty, offering a discount, or refusing to provide service, based on the consumer’s consent decision. AB 1859 would require Consumer Credit Reporting Agencies to protect consumer information by patching vulnerable computer systems within ten days or be subject to civil penalties awarded to individuals whose data was compromised. 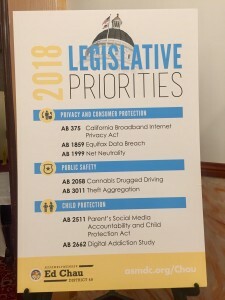 AB 1999 would expand existing authority for municipal and public utility districts to develop public broadband services to community service districts, and require those entities to adhere to “net neutrality rules” when providing such services. AB 2511 would outlaw fine print, boilerplate terms and conditions language on social media websites and applications that presume children obtain parental consent to having their images and names used in marketing. AB 2662 would establish a program, under the Governor’s Office of Planning and Research, to study the role and addictive impact of electronic media on the cognitive, social, and behavioral development of children. AB 2058 would require law enforcement agencies to send data to the Department of Motor Vehicles on the number of arrests made for driving under the influence of cannabis. 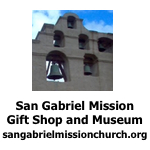 AB 3011 would allow distinct, but related incidents of theft, whether committed against one or more victims, to be aggregated to a charge of grand theft. 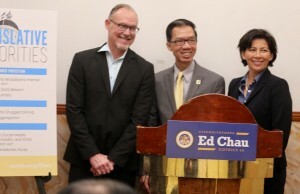 Assemblymember Chau was joined at the press conference by Ed Howard, Senior Counsel to the Children’s Advocacy Institute, and Dr. Irella Perez of Common Sense Kids Action. On March 07 State legislators, key academics, industry experts, government liaisons, and consumer representatives convened on Tuesday for the first hearing of the California State Assembly on Artificial Intelligence (AI). The committees examined the promises and challenges associated with AI, and impact it may have on the workforce, consumers, government, and businesses. Also considered was the role that the Legislature should take in approaching this complex and emerging issue. A recently published article by Wired titled, The Wired Guide to Artificial Intelligence, noted that AI is frequently associated with technologies linked to our smartphones, or new gadgets like virtual assistants or smart speakers like Alexa or Google Home. Beyond such examples, however, it is not as obvious what AI looks like five years down the line, let alone 10. Similarly, it is not as readily foreseeable as to what the AI applications are in the social and governmental spaces and how exactly AI may play a role in shifting and changing our society and our economy in the next decade. At the joint informational hearing, the Committees heard about both traditional and less traditional applications of AI that range from the commercial, social, and governmental spaces, as they prepare to grapple with the question of how we should view the opportunities and challenges of AI through the public policy lens. The hearing was titled, “Identifying the Promises and Challenges of Artificial Intelligence: shaping the future of California public policy to prepare and protect the state’s population, including its workforce and consumers, while simultaneously driving innovation and productivity as a leader in the global marketplace.” It included expert testimony from Olaf J. Groth, Ph.D., at HULT International Business School, UC Berkeley BRIE & WITS, and Cambrian.ai; Lenny Mendonca, Co-Chair of California Forward, Senior Partner Emeritus at McKinsey, and Chairman of New America; Robert Atkinson, President of the Information Technology and Innovation Foundation; Doug Bloch, Political Director at the Teamsters Joint Council 7; Peter Liebert, Chief Information Security Officer at the California Department of Technology; Vikrum Aiyer, Vice President of Public Policy and Strategic Communication at Postmates; Paul Dagum, MD & PhD, the Founder and Chief Executive Officer of Mindstrong; Matt Cagle, Technology and Civil Liberties Attorney, ACLU of Northern CA; Jonathan Feldman of the California Police Chiefs Association; Dana Rao, Vice President of Intellectual Property and Litigation at Adobe; Sara Flocks, California Labor Federation; and Samantha Corbin, Privacy Rights Clearinghouse and Electronic Frontier Foundation. 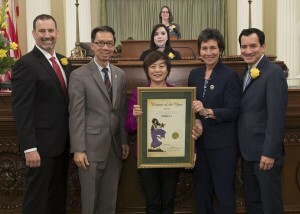 On March 12 Assemblymember Ed Chau (D-Monterey Park) honored Stella Li as the 2018 “Woman of the Year” for the 49th District during a legislative ceremony held at the Assembly Chambers. The ceremony recognizes women who have made outstanding contributions to California, as part of Women’s History Month. Stella Li is the Senior Vice President of BYD Company Limited & President of BYD Motors Inc., a technology company based in Southern California that develops and manufactures battery-electric zero-emissions vehicles, energy storage systems, and renewable energy products. Ms. Li joined BYD in 1996 as a Marketing Manager for Global Exports. Under her management, she has expanded headquarters and successfully launched BYD’s automotive businesses in North and South America. She also helped launched cutting edge technology in markets across California and the globe. Under Stella’s leadership, BYD has achieved exponential international market growth and became a dominant global force in clean technology and consumer electronics. Ms. Li is a resident of San Marino, California.